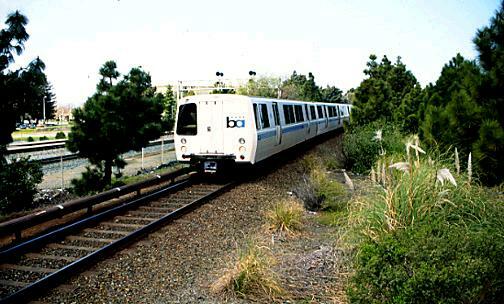 On March 16, 1999, I spent a day riding the Bay Area Rapid Transit (BART) system. 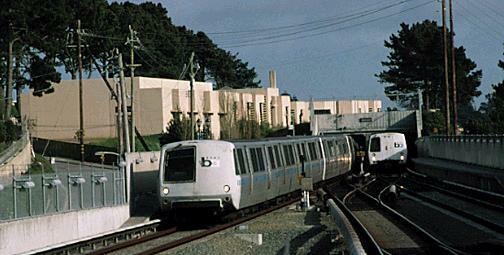 BART is one of the oldest of the "modern" rapid transit systems, and still one of the most efficient and best. It wasn't my intent to ride BART all day -- all I needed were some stock photos for upcoming projects -- but I found a lot of photographic variety and didn't leave the system until dusk! I also shot other rail activity during this week-long trip to California. You can find these photos in the To the Bay and Stockton Tower's Last (?) Winterail sections. Our tour will begin on the San Francisco side of the bay at Colma. We'll then stop at Daly City, the next station north. 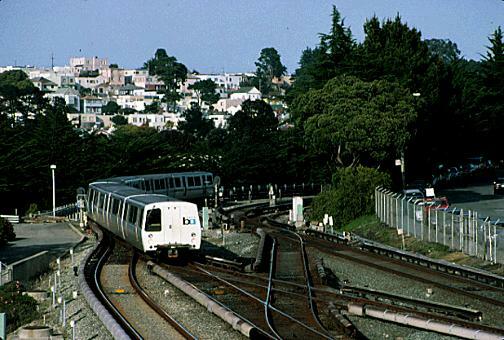 The remainder of the stations on this side of the bay are in a subway. Our tour will resume at the north end of the East Bay side at Richmond. We'll stop at El Cerrito del Norte and El Cerrito Plaza. 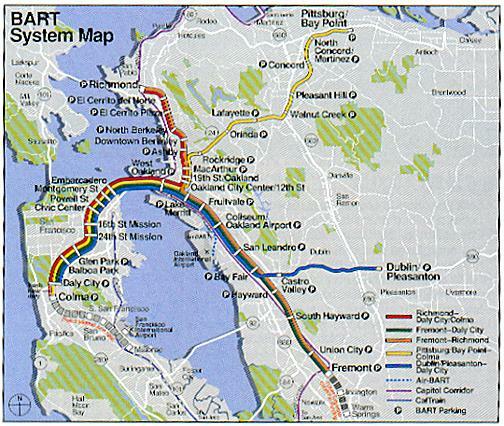 The stations in Berkeley are also in a subway, but we'll parallel the bay and our next stop will be Fruitvale. Continuing south we'll also stop at San Lleandro, South Hayward and the south end of the line at Fremont. Our tour will finish by going to the MacArthur transfer station and making one stop (at Lafayette) on the northeast line to Pittsburg. Alas, we'll need to return some day to cover the Dublin/Pleasanton line. 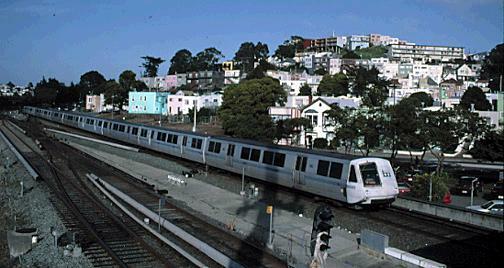 Starting at Colma, we find two trains ready to head north to downtown San Francisco. A pedestrian walkway provides a great vantage point for viewing the action at Daly City. This scene shows a southbound train with a telephoto lens. Still at Daly City, we see a train going away toward the city. At Richmond, the north end of the East Bay side, trains enter the station from the layover yard through a small patch of piney woods.